Monday January 1st 1900 A cold day. I was busy about home all day I was fixing mittens for Will when not busy with the house-work. A quiet New Years day. 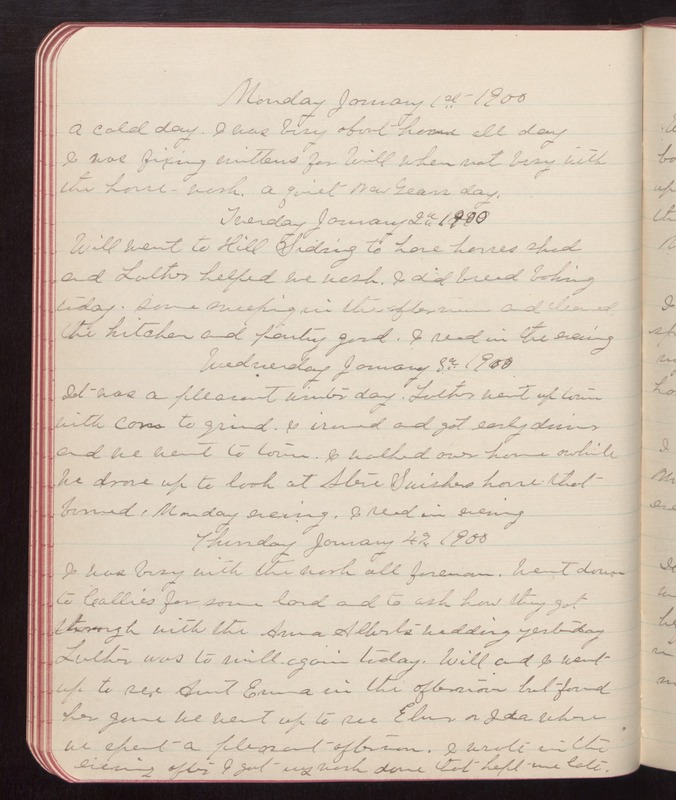 Tuesday January 2d 1900 Will went to Hill Siding to have horses shod and Luther helped me wash. I did bread baking today. Some sweeping in the afternoon and cleaned the kitchen and pantry good. I read in the evening Wednesday January 3d 1900 It was a pleasant winter day. Luther went up town with corn to grind. I ironed and got early dinner and we went to town. I walked over home awhile We drove up to look at Steve Swishers house that burned Monday evening. I read in evening Thursday January 4th 1900 I was busy with the work all forenoon. Went down to Callies for some lard and to ask how they got through with the Anna Alberts wedding yesterday Luther was to mill again today. Will and I went up to see Aunt Emma in the afternoon but found her gone We went up to see Elmer & Ida where we spent a pleasant afternoon. I wrote in the evening after I got my work done that kept me late.